Are you ready to get back your clear, even skin tone? Maybe you’ve spent too much time in the sun, fought with acne or recently gone through a pregnancy and feel like your skin has become riddled with brown spots, age spots, dark scars, freckles, sun damage or melasma? 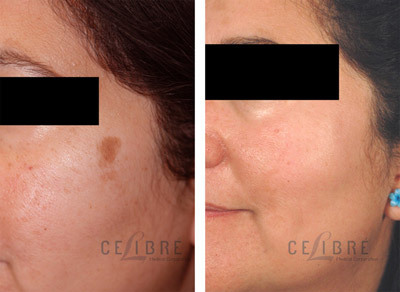 If your skin could use a makeover due to brown spots, then we’d like to talk to you. 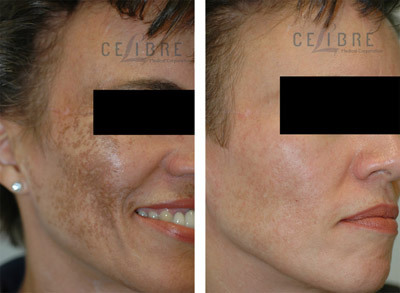 Celibre Medical has a wide variety of both laser and topical skincare options available to treat all of these problems. The factor common to all of them is excess pigmentation, or melanin. Our q-switched lasers are great for reducing excess melanin. They work by zeroing in on the extra pigmentation in the skin and breaking it up into smaller bits using heat energy. This lets your body reabsorb it naturally, and the end result is clearer, more even skin. It is an effective, process that takes 1-3 treatments to see the full results. Call us today to see if one of our treatment options is right for you! Don’t live with uneven skin tone another day. Treatment may be easier and more effective than you think! Contact us today to schedule a FREE brown spot removal consultation! Melasma is a very different condition which is related to hormonal changes and occurs mostly in women. It is a condition that results in large brown patches on the cheeks, forehead and upper lip. These patches are often located deeper in the skin which makes them more difficult to treat with lasers. We use topical depigmentation programs that use up to 8% hydroquinone. Our program works better than traditional hydroquinone based programs for several reasons. It is dispensed in liquid form making easier for the medication to penetrate deeply into the skin. It is activated on the day you purchase it. Because hydroquinone has a short shelf life this is very important. And finally, it is stronger than most hydroquinone based programs, up to twice as strong as a typical prescription product. Acne scars appear as dark spots for olive and darker skin types. After the acne has healed brown spots can last for weeks, months or even years. To speed up the removal of brown acne scars, we use hydroquinone (6% – 8%) pads and laser treatments. In most cases, the topical medication (hydroquinone) is enough to remove the spots, but when the dark scars are longer lasting or more resistant we like to use lasers. 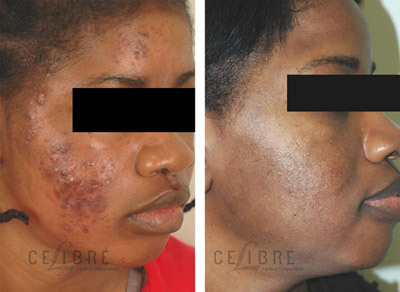 Brown spots and dark spot scars are a type of hyperpigmentation related to skin trauma that occurs in darker skinned patients. Asians, Hispanics and African Americans can all get dark spots and brown scars after getting scraped, burned or poked. To treat these types of dark marks, we use liquid hydroquinone (6% – 8%) medical pads and/or laser treatments. In most cases, the hydroquinone works quite well, but for scars where the texture of the skin has changed (bumpy or indented) we will often turn to lasers to remove the dark marks.